Red Canyon is a fantastic gorge carved over the years by the mighty Green River. In 1964, the floodgates of Flaming Gorge Dam were created from the waters of the Green. The color contrast between the red walls of Red Canyon and the green/blue color of the lake is indeed photo worthy. 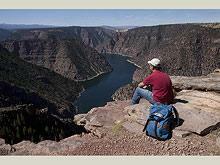 This route follows the south side of the canyon rim and provides many spectacular overlooks of the lake below. The single- track trail sits 1,700 feet above the lake and 4,000 feet across the north rim. Red Canyon Visitor Center has water and restrooms. Red Canyon Lodge has a restaurant, grocery store, cabin rentals, as well as bike rentals. Recreation Fee Pass required. For more information, call the US Forest Service, Flaming Gorge Ranger District at (435) 784-3445. 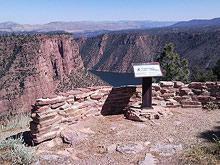 From Vernal, head north along US 191/UT44 to the Red Canyon Visitor Center turnoff about 40 miles from town. The turnoff is located between mileposts 3 and 4 on UT44. The Visitor Center is 3 miles down the road. The single track begins next to the restroom on the right (east) side of the parking lot. The trail follows the rim of the canyon and is clearly marked by blue diamonds on the trees. Along the way, look for turnouts to overlooks, most of which are signed. 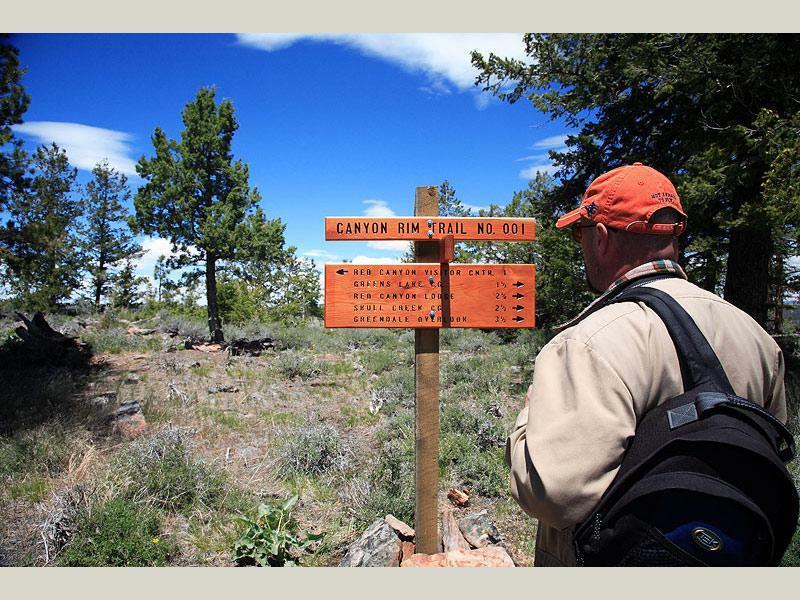 After about a mile, the trail passes through Canyon Rim Campground and continues along the rim for about another mile. It then heads south away from the rim. Up ahead is a junction. 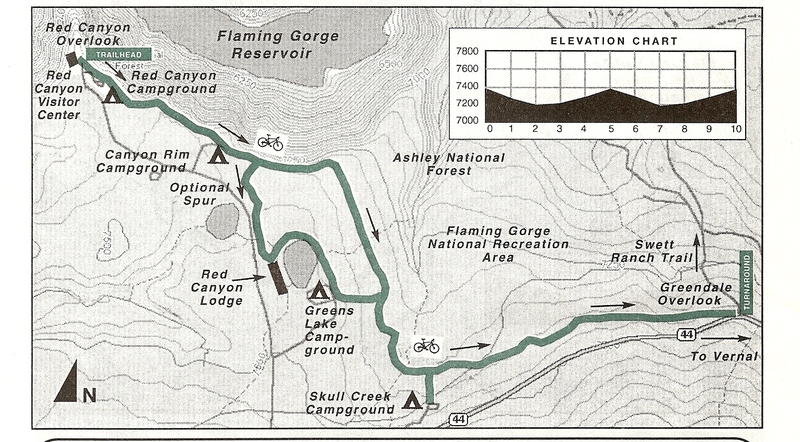 The left fork drops, crosses Skull Creek, and continues to the Greendale rest area. This is a good turnaround point. Advanced riders may incorporate the Swett Ranch loop here (see Swett Ranch Trail listing). The junction's right fork heads west and follows blue diamonds around a middle loop in the trail. Thank you for visiting http://www.flaminggorgecountry.com/Red-Canyon-Rim! Be sure and revisit flaminggorgecountry.com frequently for content updates and more.